10 April 2015. 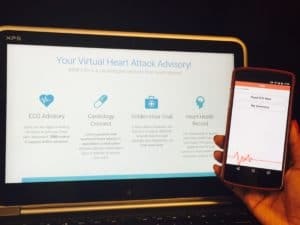 Bangalore, India: Unitus Ventures (formerly Unitus Seed Fund), India’s leading venture seed fund supporting startups innovating for the masses, announced that the first company to participate in its StartHealth Investment Program is iMMi Life, a mobile cardiac services company based in Chennai. iMMi Life offers doctors access to on-demand opinions of multiple credentialed cardiologists for ECGs, thereby increasing the capability of the doctor to recommend next steps for patients who may have experienced a heart attack. iMMi Life will implement an extended pilot utilizing 50 lacs ($80k) of non-dilutive capital and support from StartHealth partners Unitus Ventures (formerly Unitus Seed Fund), PATH, Manipal Hospitals, Narayana Health, & Pfizer. Additionally, iMMi Life will receive a seed investment from Unitus Ventures (formerly Unitus Seed Fund) conditioned on the success of the pilot. India has the highest global incidence of coronary heart diseases and the lowest number of cardiologists per capita (1 for ~2.5 lacs/250k people). Additionally, lack of accurate diagnosis, stabilization support, and treatment of the patient within the “Golden Hour” at the first point of care leads to a high number of preventable cardiac related deaths in the country. In the absence of a cardiologist’s opinion, General Physicians (GPs) are often reluctant to diagnose a cardiac event. When a patient presents with a potential event, GPs typically refer away the patient for further diagnosis and treatment to a tertiary care hospital, often without stabilization. This unfortunately leads to a high number of false positives or delayed treatment, and hence many lives lost. iMMi Life’s service provides GPs with quick near real-time access to diagnosis/opinion from expert cardiologists. When a patient with symptoms of a likely cardiac event visits a nearby iMMi Center, the GP or a paramedic records an ECG. If the GP is unable to make a diagnosis of the condition – which can be the case up to a third of the time – (s)he uploads the ECG image on the iMMi mobile application. Expert cardiologists who are ‘currently live’ on the iMMi network review the ECG right away and can provide an immediate advisory opinion on the patient’s condition. iMMi Life was founded by Manick Rajendran. Mr. Rajendran is a serial entrepreneur and healthcare professional. He also has experience running two large hospitals in Tamil Nadu and a genomics company. Mr. Rajendran saw the opportunity for iMMi when he was running the hospitals. He has an engineering degree and a MBA from IIM Bangalore. Dr. Mani Sivasubramaniam, iMMi’s Chief Medical Officer, is a paediatric cardiothoracic surgeon with extensive surgical and consulting experience. Previously, he also founded a non-profit, Dr. Mani Children Heart Foundation, with a mission to raise awareness and help sponsor treatment for children with congenital heart diseases. Dr. Saravana Ganesh, iMMi’s Head of Partner Networks, is a highly qualified cardiothoracic surgeon with 20+ years of medical and surgical experience in India and UK. He heads partnerships with tertiary care centers and iMMi centers. Rangarajan Sriraman, iMMi’s Head of Operations, is a successful tech entrepreneur and strategic advisor/mentor to startups. He co-founded Maples ESM, an IT infrastructure company and exited to Barings PE. Saravan Kumar, VP Marketing, has 15+ years of entrepreneurial experience running his family business. StartHealth is an innovative program to provide up to INR 10 crore (US$1.6M) in grants and investments to very early-stage startups seeking to enhance access to affordable technology-driven healthcare products and services for the low-income masses in India. The program offers for-profit healthcare startups non-dilutive capital, hands-on support, access to expert advisors, medical facilities, and seed venture capital, enabling them to more efficiently and effectively complete development and scale their operations in India. StartHealth was created by Unitus Ventures (formerly Unitus Seed Fund), Pfizer Inc., PATH, Manipal Hospitals, and Narayana Health. iMMi Life was established as a company to use simple, proven technologies and methodologies to deliver high impact results using minimum information. It is a disruptive culture code focused on providing transparent, collaborative, exceptional experience in providing emergency assistance to solve imminent heart problems at affordable rates. iMMi Life is based in Chennai.